A wheelchair is a straight-backed chair mounted on wheels with ﻿﻿locking ﻿mechanisms, used for transporting the ill, injured, or people who suffer from limited mobility. 1 What Is a Wheelchair? These are medical devices and considered Durable Medical Equipmen﻿t for the purposes of Medicare Part B. While there are a number of types and designs, at the end of the day, all are optimized to transport the elderly, infirm, and those with mobility issues, and provide a greater degree of independence. 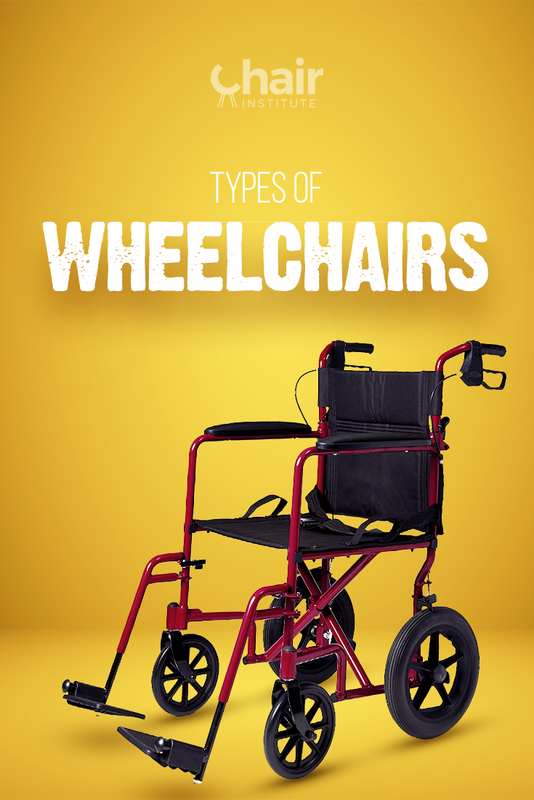 We’ll talk about each of these, in turn, then at the end, display the different types of wheelchairs in pictures. One of the most unusual types of power wheelchairs, these are niche products, but well worth a mention. They feature large inflated tires (and sometimes tank tracks!) with deep treads that enable them to go over just about any terrain. Many models are more like mobility scooters than wheelchairs, but they do make all-terrain wheelchairs in more traditional forms as well, including manual models. They’re perfect for the outdoorsman who has lost mobility, but not a sense of adventure. These are what most people think about when you mention the phrase. Most commonly seen in hospitals and nursing homes, they are the most economical choice for most people. Having said that, of all the types of wheelchairs for elderly, there are available; this is probably a sub-optimal choice because many older people lack the upper body strength to propel themselves, requiring an assistant to get them where they want to go. A motorized wheelchair or mobility scooter is almost always a better choice if it can be made to fit into your budget. Electric wheelchairs are far and away the most popular variety because they allow those who use them greater freedom of mobility without having to rely on a nurse or other assistant, except perhaps for getting into the chair. Once in position, however, even people with serious mobility issues can get around quite easily. These are one of the best types of wheelchairs for cerebral palsy sufferers, and people with similar mobility-restricting conditions. They’re significantly more expensive than their manual counterparts but well worth the extra expense! These can also have multiple variations, like the foldable electric wheelchair, as well as be customized and adapted to particular needs. This is another niche product, primarily used by airlines to facilitate transport of people who have disabilities, but if you have mobility issues and travel frequently, you can certainly invest in one privately as well. They tend to be smaller and lighter than traditional manual wheelchairs, being designed to pass between the rows of seats on an airplane, and come with safety buckles so that you can buckle up while in flight, just like all the other passengers. Another highly specialized design, these are almost always made from PVC or hollow aluminum tubes, with almost cartoonishly large wheels to make it easier to traverse the sand. Just because you have mobility issues doesn’t mean you have to be limited in the things you can do or enjoy! This is another highly-specialized type of chair, expressly designed with obese patients in mind. Constructed on a sturdier frame with a wider seat, these chairs provide the full range of mobility options to people who suffer from extreme weight issues. An ergonomic wheelchair is designed as a synthesis of a standard, manual wheelchair, merged with an ergonomic office chair with superior lumbar support﻿. They’re ideal chairs for people who spend extended periods of time sitting down. Kid-sized wheelchairs, these are functionally identical to their full-sized cousins, just made smaller to better fit their users. An exceptional niche design, offering all the benefits of a recliner, rolled into a wheelchair. These designs come with a pillow to offer greater comfort when resting in a reclined position. While it’s possible to nap in chairs of this type, you’ll almost certainly want extra padding if this is your intention. These are the best types of wheelchairs for spinal cord injury patients if a recline feature is desired. If there’s one limitation of manual wheelchairs, it is that the user, by necessity, needs both arms to propel the chair. If you try to just use a single arm, you’ll wind up going in circles and get nowhere fast. The single-arm drive wheelchair solves this problem by connecting the two wheels by a specially-shaped axle, allowing you to move forward using only one arm. There are two basic variants in this category. Sports wheelchairs are constructed the same way as a standard wheelchair, except that the large rear wheels are angled in toward the seat, allowing for tighter turns, and enabling users to engage in a full range of sports activities (tennis, basketball, etc.). The racing variants typically sport two large rear wheels, angled inward as described above, and a single, smaller front wheel. Designed for speed, they allow users to participate in competitive racing sports. As the name implies, this type of wheelchair is designed for use while standing. Most models allow for reconfiguration so they can be utilized in both seated and standing positions. While not the most technically advanced design currently available, this type of chair has the distinction of turning the user into a kind of living Transformer, just like in the movies! In the world of wheelchairs, there’s a raging debate about which is superior: reclining or tilt wheelchairs? They both accomplish the same basic goal, although they achieve it via different means. These are the best types of wheelchairs for cerebral palsy patients if a recline feature is desired. Ultra-light wheelchairs are, as their name implies, significantly lighter than their mainstream counterparts. To accomplish this, they make certain concessions, including a shortened seat back, and being constructed with lighter-weight materials. An intriguing design not typically purchased for home use, but used by EMTs and hospital professionals. They’re lightweight wheelchairs that can recline 180 degrees, effectively becoming a stretcher when the catch is released. In the picture below, note the presence of two sets of handles. One for use when in wheelchair mode, and another for use when in stretcher mode. There is one additional type of wheelchair worth mentioning. We didn’t list it among the major types, because it’s cutting edge technology and not yet widely available, but that’s changing. The iBot is a high-tech wheelchair with an extra set of wheels. When the user desires, the chair can be made rise up on two of its wheels to walk up or down stairs. Its design is such that it can traverse almost any terrain. Basically, it’s every type of wheelchair mentioned above, all rolled into one. Obviously, as a segment of the population, a higher percentage of older folks use wheelchairs than any other age group. Time has a way of catching up with us, after all. Some of these will, of course, only be viable if certain conditions are met. A 98-pound senior is going to have no practical need for a bariatric wheelchair, for instance. In a similar vein, older people may not have the strength to push a manual wheelchair, so that may only be a viable option if the person in question has access to a human assistant. While an electric wheelchair is an obvious choice for someone with such limited mobility, the only way it could be made to work reliably would be to pair it with an Emotiv headset as we’ll describe below. This would allow the paraplegic to control the motion of the wheelchair either with thought or simple movements like eye blinks. Technically, the history of the wheelchair dates back to 1595, when an unknown inventor built a wheeled chair for King Philip II, of Spain, but the design was not copied or used by anyone else, and when Philip died, his chair died with him. The idea resurfaced again in 1655 when a paraplegic watchmaker named Stephen Farfler built a mechanized chair for his personal use. This chair was built around a three-wheeled chassis, but like King Philip II’s chair, when Farfler died, his design died quietly with him. It wasn’t until 1783 that the device we recognize as a wheelchair made its first appearance, brought to use by John Dawson, who lived in the city of Bath, England, which is why the design was known as the Bath Wheelchair. The original Bath design featured a single smaller wheel in the front, though over time, this morphed into the two smaller wheels in the front that we see today. The collapsible feature seen in most types of manual wheelchairs today was invented in 1933, by Harry Jennings for a disabled friend. The first patent filed for a motorized wheelchair was recorded in 1916, although it wasn’t until the mid-1950’s that they emerged as a viable product. The current, cutting edge technology is the mind-controlled wheelchair. This technology isn’t built into the chair itself but is rather contained in a headset worn by the person sitting in it. The headset like this one (https://www.emotiv.com/) measures brain activity when the wearer thinks about moving the chair, charting the differences in electrical signals when the user thinks “forward,” “backward,” “left,” “right,” and so on. By identifying changes in brainwave patterns, an electric wheelchair interfaced with this device can be controlled by the power of thought alone, making it one of the most exciting types of wheelchairs for paraplegics, and others with extreme limitations of mobility.